Choose finely crafted pipe tobacco blends from Roxwell and get ready for a superior smoking experience. Natural flavors and smooth tastes of Roxwell tobacco are for those who value sophisticated smoking mixed with immense pleasure and enduring delight. Selected from the popular tobacco-growing regions, the ingredients in these products can be your most appropriate choice. 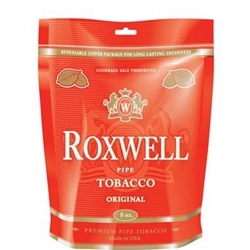 Buy Roxwell Menthol, Roxwell Original and Roxwell Smooth pipe tobacco 16 oz packs at great prices. We offer the best online deals for only authentic pipe tobaccos and cigars.